This is a sponsored post written by me on behalf of Ohio Pork Council & Ohio Soybean Council. All opinions are my own. 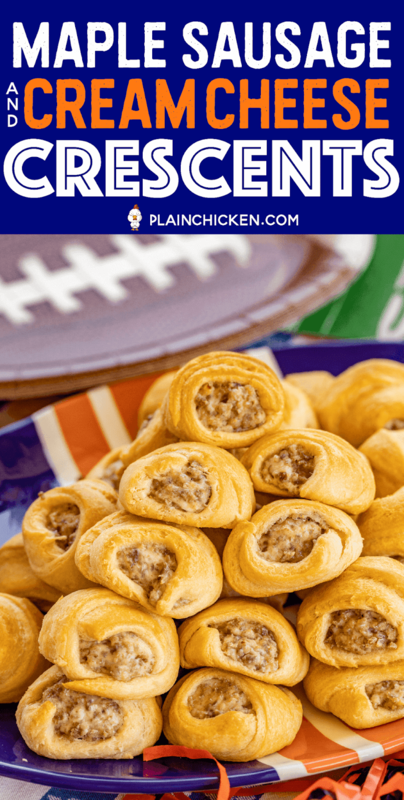 These Maple Sausage and Cream Cheese Crescents are perfect for watching football and holiday snacking. We love them any time of the day - breakfast, brunch, lunch, snack, and dinner. 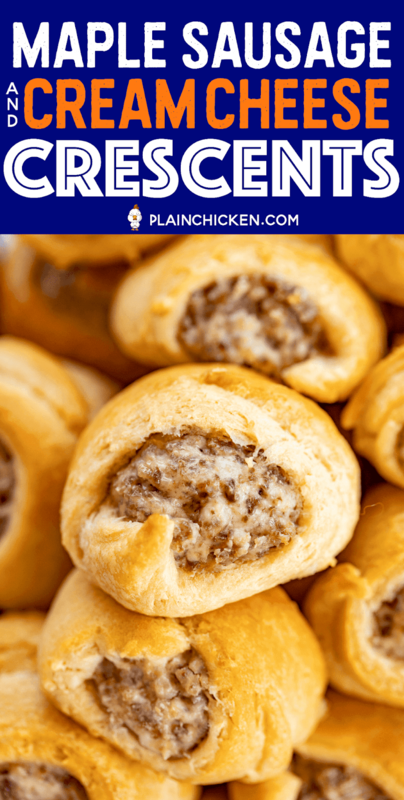 You can make the maple sausage and cream cheese filling ahead of time and refrigerate until you are ready to bake the crescents. Bake a few or the whole batch! 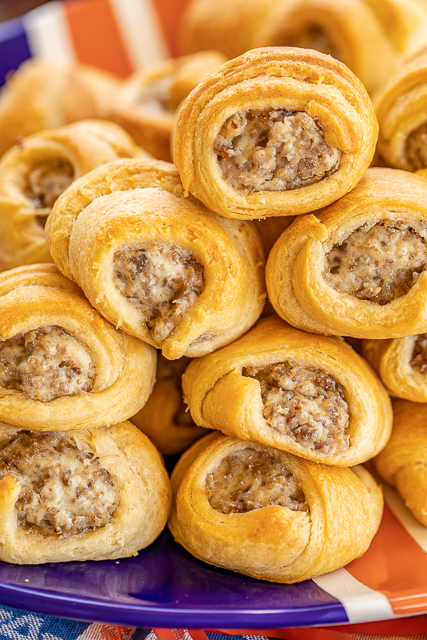 These Maple Sausage and Cream Cheese Crescents are my kryptonite. I have no self-control when these things are around. I just keep stuffing them in my mouth. I can't stop eating them. I love them!! 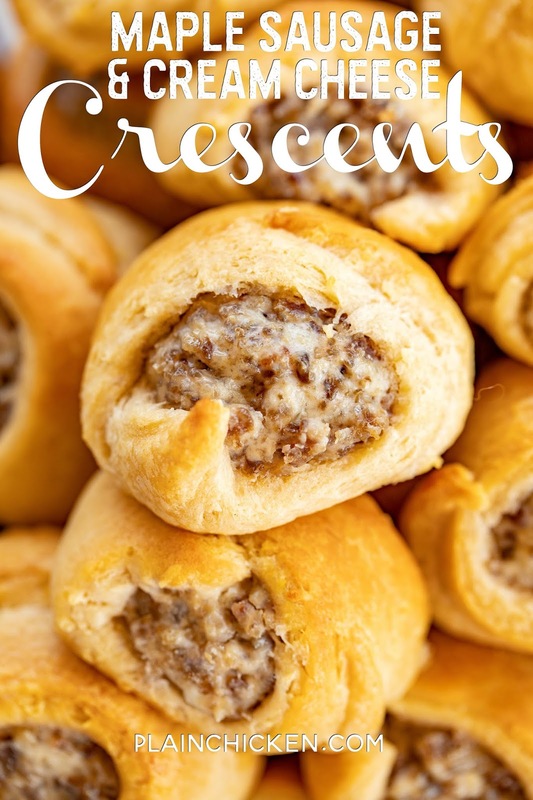 I already have the stuff to make these Maple Sausage and Cream Cheese Crescents again. With only four ingredients, they are great to make a quick snack any time of the day. 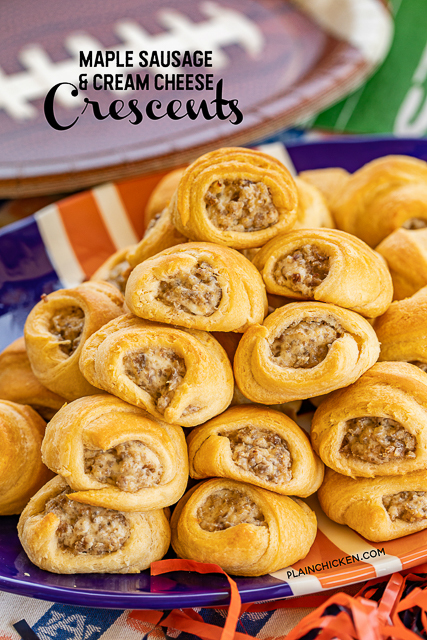 These Maple Sausage & Cream Cheese Crescents are PERFECT for Christmas morning! 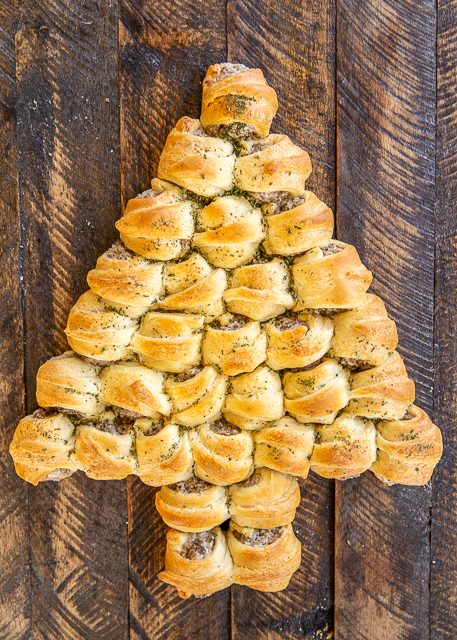 Make the sausage filling Christmas Eve and bake them up in this cute Christmas Tree shape! 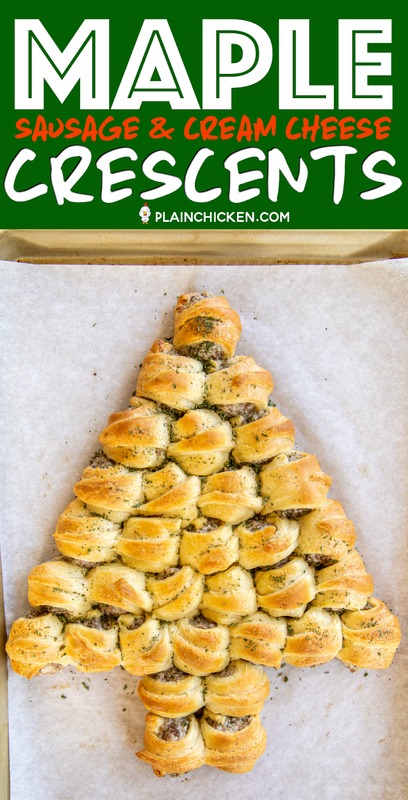 I sprinkled the baked crescents with some parsley so the tree was green. SO easy & SO festive!!!! In a skillet over medium heat, cook maple sausage until no longer pink and crumbled. Drain fat. Mix cooked sausage, cream cheese and maple syrup together. Separate rolls into triangles. Cut eat triangle in half lengthwise - making 32 triangles. 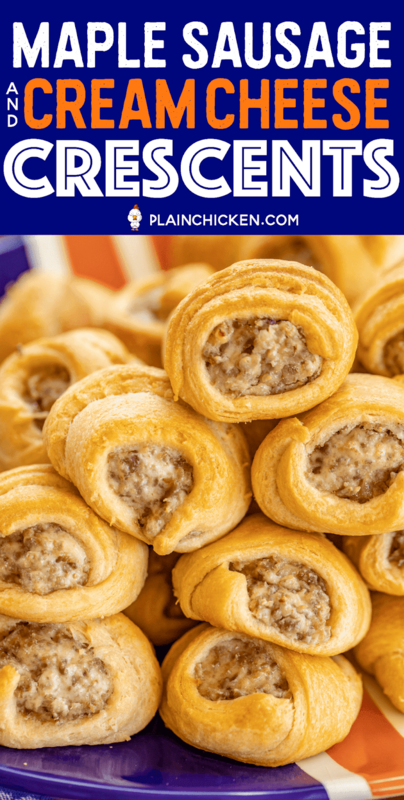 Using a small cookie scoop, scoop sausage mixture onto the wide end of each roll and roll up. I'm just really excited to see someone putting out an egg free breakfast recipe!! Thank you! I'll have to try them. Enjoy!! 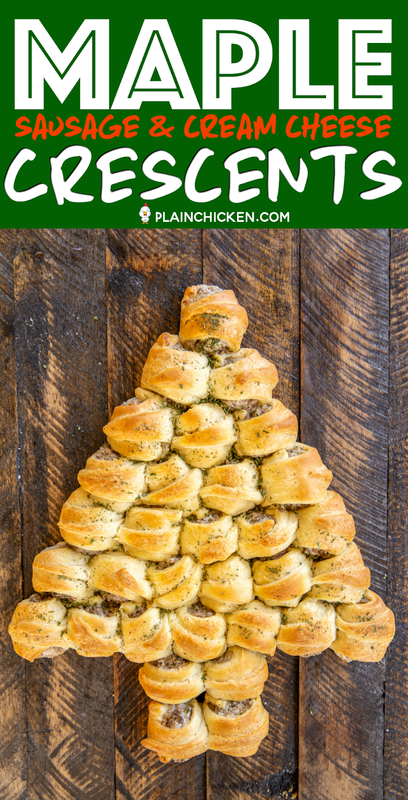 These are so easy and taste great! These look great! Do you know approximately how big the tree is (height and width)? I'm trying to figure out if I have a serving platter that will hold it. Thank you! Sunday hospitality after Mass this Sunday!!!!! What a treat! I dont like Maple at all do I need to use something else in place of syrup? I made these today. They are very good. I found that if I let the mixture sit a little bit, it firmed up and stayed in place better when I rolled them and the rolls would hold a bit more of the mixture. Everyone loved them, so I will definitely make them again! Think it would be ok to freeze these before the final baking step for impromptu snaking? I haven't frozen these, but I think it would be fine to freeze the uncooked crescents. Thanks so much! Your recipes are always a hit! We cooked half so far, they taste amazing.